Self Cure Remedy details of Eat black plum (jambul) for the care and relief of Diabetes, including effectiveness and popularity scores of the remedy. 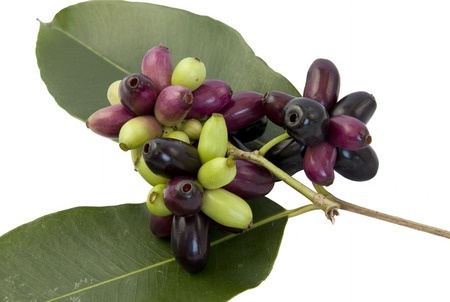 Black plum helps control the conversion of carbohydrates into blood sugar. The excessive thirst and frequent urination problems common among diabetic people can also be controlled by the fruit. Along with the fruit, the leaves, berry and seeds of the black plum tree can be used to control blood sugar level. Consume black plum friuts, drink black plum juice or take black plum seeds powder. Jambolan might lower blood sugar levels. Use caution if you have blood sugar related conditions. Stop using jambolan at least 2 weeks before a scheduled surgery. The self cure remedy of Eat black plum (jambul) for the care and relief of Diabetes has an effectiveness score of 3.0 and a popularity score of 1 on the self-cure system.